SPOKANE, Wash. – R. Keith Campbell embodies just about every characteristic you can use to describe lifetime achievement within the profession of pharmacy. 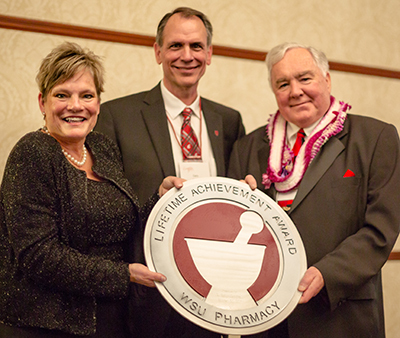 The WSU College of Pharmacy honored Campbell on Oct. 20 with its Lifetime Achievement Award. The award recognizes a track record of excellence in pharmacy, patient care, advocacy, research, service and mentoring or teaching. It is the most prestigious honor bestowed on an individual from the WSU College of Pharmacy. The award, presented to Campbell at the college’s Crimson Gala, was created by artists David and Forest Govedare. David is known for his horse sculptures near Vantage, Wash., and his Bloomsday Runners sculpture in downtown Spokane. Professor Emeritus R. Keith Campbell (r-l) receives the College of Pharmacy Lifetime Achievement Award from Dean Gary Pollack and Vice Dean Linda Garrelts MacLean. Photo by Jacqueline Q. Garza. To further honor Campbell’s legacy, the money raised at Friday’s gala goes towards naming the R. Keith Campbell Applied Patient Care Lab in the Pharmaceutical and Biomedical Sciences Building at WSU Health Sciences Spokane. The applied patient care lab is where students learn hands-on patient care skills. Student pharmacists engage in peer-to-peer role-play that includes faculty-led feedback and discussion. Pharmacy alumni and friends raised enough money at the gala to allow the college to not only name the lab, but also the student study area on the same floor. “It is only fitting that we can dedicate the teaching space and the student study space to honor Keith, since he has made such a difference in the lives of so many students at WSU,” said Gary Pollack, dean of the college. To immortalize Campbell’s contributions to pharmacy, the WSU College of Pharmacy is proud to announce that going forward its Lifetime Achievement Award will bear his name. The R. Keith Campbell Lifetime Achievement Award will honor the leaders, entrepreneurs and ground-breakers of the future who will shape the healthcare landscape in generations to come for the betterment of humankind. Campbell grew up in Spokane Valley, Wash., and is a WSU graduate. He served more than 45 years at the WSU College of Pharmacy in a variety of roles, including program administrator, professor, director, student advisor, and associate dean of student services. Over the course of his tenure Campbell contributed to more than 700 publications, and he helped create the clinical pharmacy curriculum and rotations for the college. Outside the classroom he developed numerous unique live and self-study programs about the management of chronic diseases, such as Type 1 diabetes. Campbell was the first pharmacist elected to the board of directors of the American Diabetes Association, and he was one of the 17 founding members of the American Association of Diabetes Educators. His list of professional accomplishments and awards is remarkable, and illustrates the profound impact he has made, both at WSU and on the pharmacy profession as a whole.